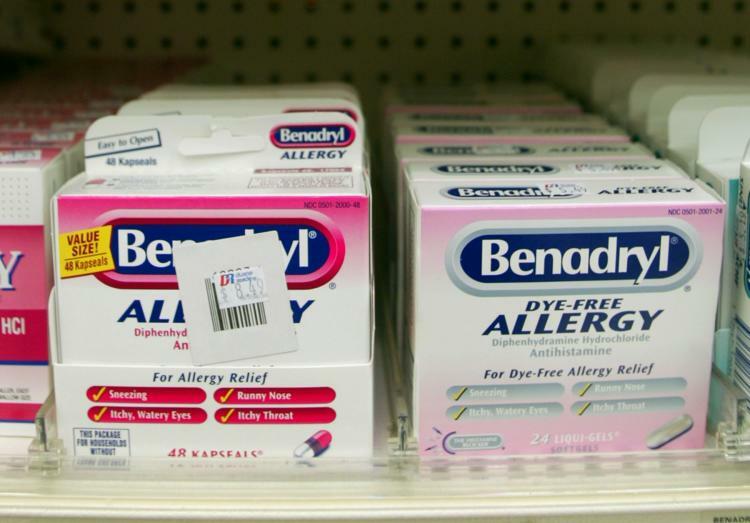 Benadryl is a very common antihistamine available both over-the-counter and as a prescription injection. The medication is a H1 receptor antagonist and works by blocking H1 and acetylcholine receptors throughout the body. This in turn helps to relieve the symptoms of an allergy and may help prevent an allergic reaction from occurring. Benadryl is the trade name for the generic drug diphenhydramine which is also marketed under other name-brands such as Nytol, Excedrin PM, Midol PM, Tylenol PM, and Advil PM. Other Generics of diphenhydramine are also available. It is dispensed in different drug formulations and strengths: 25 and 50 mg capsules; 12.5, 25, and 50 mg tablets; 12.5 and 25 mg strips; 12.5 mg/5ml elixir; 25 mg/5ml suspension. It is also available in injection solution of 50 mg/ml. Children’s versions of the product like "Children’s Allergy" are easier to ingest and often flavored. Consult your healthcare provider before giving this medication to children under the age of 12. Diphenhydramine and Benadryl are not recommended for children under the age of 6. Diphenhydramine was originally approved by the U.S. Food and Drug Administration in 1946. Prior to 2007, Pfizer Consumer Healthcare held exclusive rights of the brand. 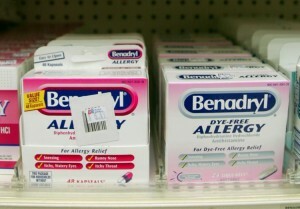 Currently, McNeil Consumer Healthcare, a subsidiary of Johnson & Johnson, manufactures and distributes Benadryl. Benadryl (diphenhydramine) is used to treat allergic reactions of all kinds including upper respiratory allergies, food allergies. Benadryl may also be used to treat cold symptoms such as runny nose, itchy, watery eyes, cough and sneezing. Itchy skin, hay fever (seasonal allergic rhinitis) and hives (chronic uticaria) may be treated with diphenhydramine products as well. Aside from its antihistaminic effect, prescription strength Benadryl also causes anticholinergic effects which are beneficial in preventing motion sickness and treating symptoms of Parkinson’s disease such as muscle stiffness and shaking. It may also be used to manage side effects (e.g., Parkinsonism or Extra-Pyramidal Symptoms) caused by certain psychiatric drugs. Furthermore, it also has a sedative effect that makes it useful in patients with insomnia. Off-label uses for Benadryl include treatment of morning sickness, autism and attention deficit hyperactivity disorder (ADHD). Consult your doctor before using Benadryl or diphenhydramine products for any off-label uses and follow your doctor’s instructions carefully. Your healthcare provider may also prescribe this drug for other medical purposes not discussed in this medication guide. Benadryl works by inhibiting a natural substance, called histamine, which initiates allergic reaction of the body during some viral infections (such as common cold) or exposure to allergens (substances that cause allergy such as pollen, hay, dander, dust and certain foods). It provides relief for itching, sneezing and increased mucus production. Aside from inhibiting histamine, it also blocks the production of another natural compound called acetylcholine which is responsible for certain symptoms of allergy such as runny nose and watery eyes. The reduction in acetylcholine also causes drowsiness which makes it a good sedative. Benadryl is dispensed in different oral drug formulation (tablet, capsule or liquid suspension). Take the medication by mouth with or without food. If stomach upset occurs, it may be taken with a glass of milk or with meals. If taking suspension, carefully shake the bottle before each dose. Use the specific measuring glass or spoon that comes with the bottle. If taking the oral-disintegrating tablet or strip, allow it to completely dissolve on the tongue before swallowing it. In case two strips are prescribed, the second dose must be taken after the first strip has dissolved. When using the chewable tablet, it should be chewed thoroughly before swallowed. Read the prescription label carefully. If you do not understand the prescription or have questions, ask your healthcare provider. Cough-and-cold products are not recommended for children younger than 6 years. Do not use Benadryl for children below 6 years old unless specifically instructed by your healthcare provider. It should not be used to make a child sleepy. Benadryl does not treat common cold virus, instead it only provides relief for symptoms. Avoid other medications that contain similar ingredients or are known to interact with Benadryl. Use caution when you drive or operate heavy equipment or perform other hazardous activities. This medication can cause drowsiness and dizziness. Your healthcare provider may recommend avoiding these activities, especially right after taking the medication or when you do not yet learn the effects of the drug to you. Alcohol also increases these side effects therefore should be avoided. If used to prevent motion sickness or cause sleep, it should be taken at least 30 minutes before the intended use. If it does not cause sleep after 2 weeks, consult your healthcare provider.